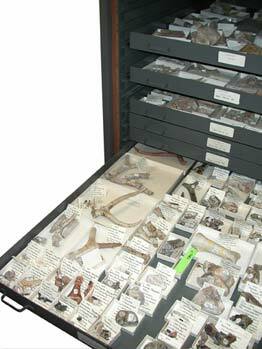 At the end of June, thirty cabinets filled with fossils arrived on a truck from the University of California, Riverside. This collection, now being accessioned into UCMP, consists of more than 11,000 cataloged vertebrate specimens from nearly 900 localities and provides a very exciting and complementary addition to the UCMP collection. Highlights include important mammal collections from the Neogene of southern California and Australia, and fossil vertebrates from the late Eocene of Seymour Island, Antarctica.